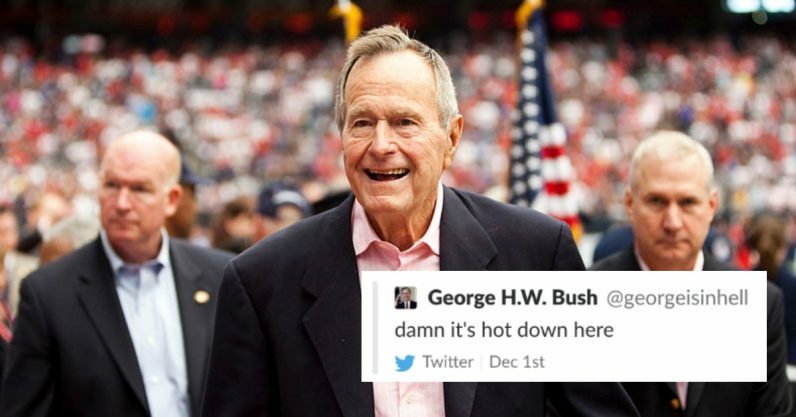 The account kept tweeting as George Bush Sr. from the underworld, but has since been suspended by Twitter for violating the platform’s rules, making its tweets inaccessible. Twitter Rules do ban impersonating accounts, but not parody accounts, making it mysterious as to why @georgeisinhell was taken down. To say Bush Sr. left a polarized presidential legacy behind would be an understatement. He effectively set the stage for America’s invasion of Iraq, which his equally controversial son, President George W. Bush, pulled the trigger on in 2003. He has been accused by many of callously ignoring the thousands who died during the AIDS epidemic in the early 90s, and neglected to fund the fight against the disease. During his campaign run for presidency, many claim Bush’s use of William Horton, an escaped African American convict, was a political weapon to fear monger and provoke racial tension. The reaction to his death on social media proved to be as divided as his legacy. Many took the opportunity to look back on his accomplishments, including his signing in of the Americans with Disabilities Act of 1990, while others pushed back, claiming any positive memorializing was ignoring the harm he had done. I can’t believe the number of followers I’ve lost tonight for benignly expressing sorrow about President Bush’s passing. Apparently, to them, I failed some ultra-progressive litmus test for seeing the good in a man I mostly disagreed with. Good riddance. The parody account went viral, and fans were quick to screenshot the tweets before it was removed. Besides for tweeting from the perspective of a burning Bush, the account tweeted negatively about his politics and retweeted his critics. It also followed only around 60 people, most of them self-declared Marxists and Bolsheviks, and his bio included a link to Marxist literature. While it’s not yet clear if @georgeisinhell was taken down for “impersonation,” many parody accounts are allowed to live on the site if it’s clear they’re indeed parodies. In the case of @putinRF_eng vs @DarthPutinKGB, the former was posing as the real McCoy and could conceivable be used to spread misinformation, while the latter was obviously satire. @georgeisinhell should clearly fall under the category of “parody,” so it should be ok under Twitter‘s impersonation guidelines. It’s possible that it falls under another type of violation, such as if it were considered abusive, but this typically involves some kind of threat, which in this case would be irrelevant. We have reached out to Twitter for explanation, and will update this article upon hearing back. Considering Twitter has been slow to moderate far right activity on its platform in the name of free speech, it struck many as preposterous that a comedic account such as @georgeisinhell was taken down. Besides for the strangeness and ambiguity surrounding Twitter‘s fair weather community moderation, this suspension also adds to the broader issue of just how toxic social media is as a place of mourning. This past June, celebrated rapper XXXTentacion was assassinated. Many claimed his violent past of domestic abuse made him ineligible for social media eulogy, while others claimed he could still be celebrated for his contributions to music post-mortem. While XXXTentacion and George H.W. Bush should not be directly compared, both cases show how attempts to moderate how others mourn for the deaths of controversial individuals fails. We cannot control how others mourn the dead, and attempting to do so in Twitter‘s moral court of public opinion is futile. We wouldn’t attempt to police the way people grieve IRL, so why do so online? Even if in bad taste, why shouldn’t @georgeisinhell exist alongside those who want to celebrate his achievements?